It takes far less time than you think to learn your first few steps. It’s one of the easiest dances to pick up and you will learn your first few steps in no time! Wear leather / suede sole shoes or socks. No rubber or street shoes please. 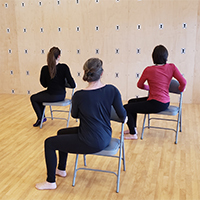 This asana class is a breath centered practice using a chair as our base of support.